Altocumulus clouds generally refer to clouds that are found in the middle range of the sky. Altocumulus is a family or genus of clouds that exist and this can then be divided into different varieties of clouds under this genus. The altocumulus floccus clouds generally indicate that there is instability in the altitude at the time of its formation. What height are altocumulus floccus found? Altocumulus floccus clouds are normally formed at about 6,500 feet but can even be formed as high as 13,000 feet. In certain regions, such altocumulus floccus clouds can be found as high as 23,000 feet depending on the latitude of the specific region. The rule of thumb here is that the warmer the climate is in a specific area, the higher the altocumulus floccus cloud base. The altocumulus floccus clouds use the scientific acronym Ac flo and are often derived from altocumulus castellanus clouds. The implication of these altocumulus floccus clouds is that there will be rain or snow, since these are middle range clouds in the sky. There is no specific classification within the altocumulus floccus clouds as they form part of the family or genus of altocumulus clouds which has several different classifications of its own. How are altocumulus floccus clouds formed? Normally altocumulus floccus clouds are formed by the mixture of warm and cold air and comprise water droplets. The altocumulus floccus clouds are generally formed when there is unstable mixing of the warm and cold air and this results in puffs of clouds being created. What do altocumulus floccus clouds look like? The altocumulus floccus clouds look like small puffs of cotton that are afloat in the sky and sometimes appear together with castellanus clouds as well. They are usually scattered throughout the sky. These altocumulus floccus clouds are very distinct as they tend to have ragged bases and rounded heads. The colors for these clouds range from white to a greyish opaque shade although the sky will not be visible beyond the altocumulus floccus clouds. How common are altocumulus floccus clouds? These altocumulus floccus clouds are very common and are clearly visible throughout the skies where they are formed. They tend to fill the sky with their shape and often cover a wide expanse of the airspace. Where can I see altocumulus floccus clouds? Altocumulus floccus clouds can be seen just about anywhere in the world. Since they are commonly formed by the mingling of warm and cold air, the depth of the altocumulus floccus clouds will determine not only the temperature but also the weather. 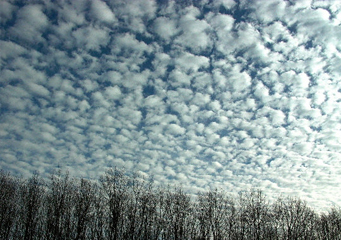 It is common that the altocumulus floccus clouds are the harbinger of rain or snow in most regions where it is formed.